IT looks like it will be a busy year for electronic payment solutions provider ManagePay Systems Bhd after it clinched two high-profile projects. In February, it received a letter of award from Bank Negara Malaysia to issue electronic money (e-money). Then, last week, it was appointed a third party service provider for China’s UnionPay International Co Ltd. 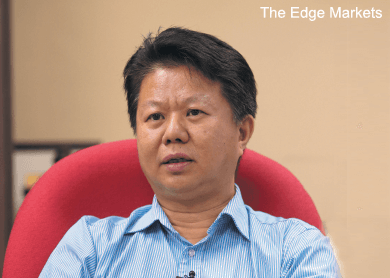 According to managing director and CEO Chew Chee Seng, ManagePay (fundamental: 1.5; valuation: 0.6) expects to book earnings from these two projects beginning in financial year ending Dec 31, 2016 (FY2016). “This is part of our growth plan to sustain our position in electronic payment solutions, with both the acquisition as well as card issuance business. This is beyond the reach of our peers that are only able to offer merchant acquisition services,” Chew, 48, tells The Edge in an interview. The acquisition business refers to the signing up of merchants to provide payment solutions at its outlets. For the UnionPay job, ManagePay’s wholly-owned unit ManagePay Resources Sdn Bhd was appointed the third party agent to provide switching and gateway services, system operation and product management for UnionPay cards in Malaysia, Myanmar, Thailand, Singapore and Indonesia. “The UnionPay project is in the acquisition business, which complements what we are already doing for our other cards business. Maybe the next stage would be for us to find financial institutions that would be interested in issuing UnionPay cards,” he says, adding that ManagePay is the third party acquirer of other cards such as Visa, MasterCard and MyDebit in Malaysia. UnionPay is the sole bank card association in China that handles interbank payments. It handled a reported RMB32 trillion (RM18.7 trillion) of transactions in 2013, equivalent to nearly 40 times Malaysia’s gross domestic product of RM835 billion. Worldwide, in terms of transaction volume in 2014, UnionPay had a market share of 31% last year, behind Visa (40%) and ahead of MasterCard (24%). “System-wise, we have strong reason to believe that we will be able to certify our card management system with UnionPay and roll out an acquiring project with a local bank before end-2015. The issuance of UnionPay cards is possible as early as the first half of next year,” Chew says. Meanwhile, ManagePay’s award from Bank Negara to issue e-money — the digital equivalent of cash — with a wallet size of up to RM10,000 per account holder, completes its payment ecosystem, with a presence in both the acquisition and issuance businesses. “We are excited about the recent award to create the e-money ecosystem, and we expect to issue some 100,000 cards under the MasterCard brand next year,” says Chew. With the implementation of Payment Card Reform Framework from January this year, he says the e-money project is in line with Bank Negara’s move to reduce reliance on cash usage. He adds that the potential earnings for the cards business will be driven by higher volume and transactions, along with recurring monthly income from rental of the card acquisition terminal. “Earnings from this business are expected to be steady, or see a significant improvement,” he says, adding that the card issuance business carries a higher margin as it is able to manage cost at both the issuance and acquisition level. ManagePay also recently partnered three banks in Myanmar, offering a card acquisition business that is transacted in US dollars, with a few hundred merchants secured. This year, the group hopes to secure approval from Singapore’s central bank so that it can expand its acquisition business there. “We are strengthening our system and infrastructure so that we can enhance our product capability and offer it regionally, especially in Asean. In the long run, this will increase the international revenue contribution,” says Chew. According to him, with the cards system in place, ManagePay is able to further boost revenue streams by cross-selling other products such as travel insurance. “This is where the role of strategic investors come in. Last month, we initiated a fundraising exercise via private placement to bring in investors that will complement and enhance our business. We are in talk with various parties and we hope to conclude it by the second half of this year,” says Chew, who controls ManagePay with a direct stake of 30.05%. On March 25, ManagePay proposed a private placement of up to 30% of its existing issued and paid-up capital at 23 sen per share. It expects to raise at least RM27.78 million, the bulk of which will be used for capital expenditure and working capital for its e-money project. “We would not call for any fundraising for the UnionPay project. It will be sourced internally,” Chew says. 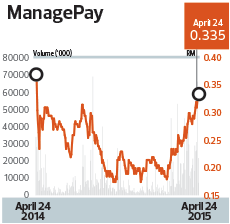 As at Dec 31 last year, ManagePay’s cash and bank balance stood at RM2.39 million, with negligible borrowings. Going forward, Chew says ManagePay aims to expand its footprint by bidding to become an approved refund agent for a tourist refund scheme (TRS) project, where it will process and refund claims made by outbound tourists on the Goods and Services Tax. The main revenue stream from the TRS project will come from the administrative and processing fees, he adds. ManagePay was recently featured by The Edge Research as a stock with momentum. The counter has risen 56% year to date, to last Friday’s close of 33.5 sen, for a market capitalisation of RM134.9 million.